(video) --- PORTLAND, Maine — On Saturday, a pack of motorcyclists is going for a ride. They’ll all be astride antique machines manufactured before the Great Depression got started. They don’t plan on stopping until they get to the West Coast. 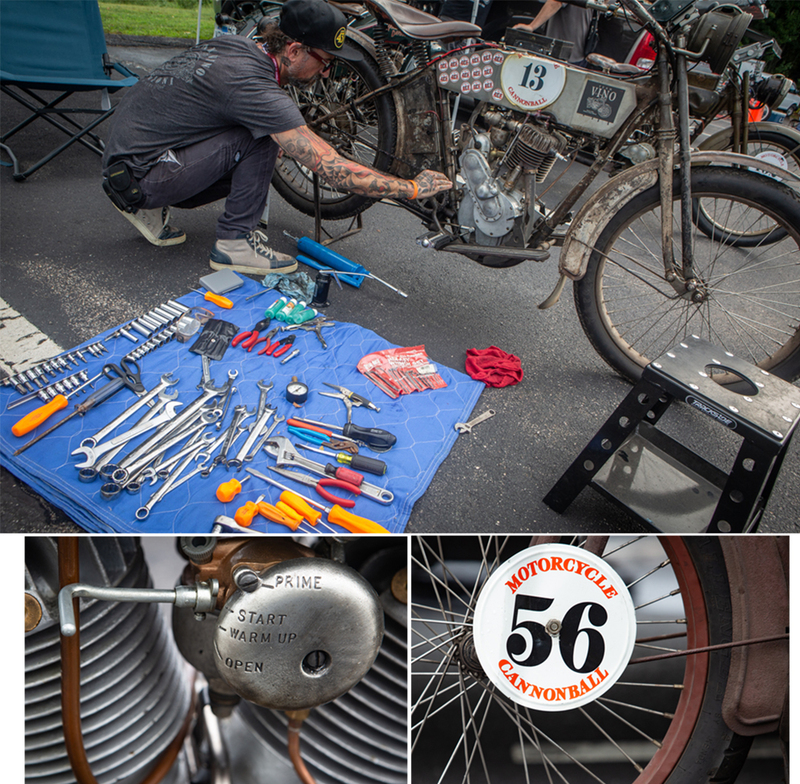 For some, it’s a chance to test their mechanical skills, keeping century-old bikes alive over all those miles. Others relish the spiritual opportunity to time-travel in the vintage gasoline fumes of history. 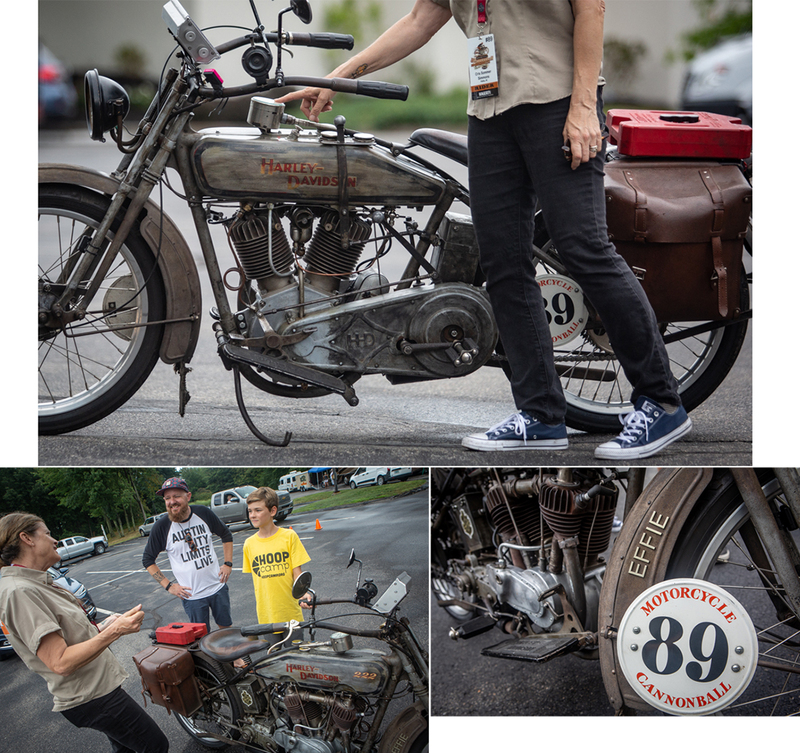 The bikers will all be riding in the Motorcycle Cannonball, a biennial, 3,600-mile endurance run designed to test both humans and their old-timey, two-wheeled contraptions. Past runs have gone from New York to San Francisco and from Florida to Washington. This year, the bikes will rumble from Portland, Maine, to Portland, Oregon. The rules are simple. Bikes must be all-original, pre-1929 models and be able to go at least 45 miles per hour. That’s it. The Motorcycle Cannonball officially gets underway Saturday morning at Big Moose Harley-Davidson on Riverside Street. Around 100 bikes — men and women from all over the country, and several foreign lands — are expected to start the race. Riders who somehow complete the journey are expected to start rolling over the finish line on Sept 23. Mechanic Chrys Miranda of Brazil (top photo) works on a 1914 Harley-Davidson motorcycle in South Portland on Thursday. Rider Dean Bordigioni plans to ride it all the way to the west coast, starting Saturday, in the Motorcycle Cannonball endurance run. Over 100 bikes — all built before 1929 — will start the run at Big Moose Harley-Davidson in Portland. On Thursday, riders were checking into the pre-run safety inspection station in a South Portland hotel parking lot. Banks was testing his green, 1921 Harley-Davidson just after a soaking rainstorm. Back home, he owns a heating company, employing about a hundred people. He said antique motorcycles are his passion. It’s his first attempt at the Motorcycle Cannonball. “We’ve rebuilt the motor, we’ve rebuilt the transmission, we have tons of spare parts with us and we’re hoping we can coax it across the country,” said Banks. Cris Sommer-Simmons (above left) speaks with Tanner Watt and son Donovan about her 1915 Harley-Davidson in South Portland on Thursday. Sommer-Simmons named her bike “Effie” after pioneering woman motorcyclist Effie Hotchkiss, who crossed the country in 1915 with her mother in a sidecar. Sommer-Simmons’ motorcycle is the exact model ridden by Hotchkiss. This will be Sommer-Simmons’ fourth run in the Motorcycle Cannonball and the third on “Effie.”. Not far from Banks stood Cris Sommer-Simmons of Hawaii and her 1915 Harley-Davidson. “Her name is Effie,” said Sommer-Simmons, pointing to the lower front fender where the name shone in chrome letters. Sommer-Simmons named the bike in honor of Effie Hotchkiss, the first woman to motorcycle across the United States in 1916. Hotchkiss rode the same model Harley and brought her mother along in a sidecar. “This will be her third Cannonball” said Sommer-Simmons, referring to the bike. It will be Sommer-Simmons’ fourth run. She said riding a hundred-year-old bike across the nation is nothing like riding a modern machine. Alyson DeCosa (right) works on her father’s 1912 Harley-Davidson motorcycle with her mother, Joan, in South Portland on Thursday afternoon. DeCosa’s father, Steve, plans on riding the bike all the way to Portland, Oregon. The whole affair is the brainchild of Lonnie Isam, Jr. of Sturgis, South Dakota. He organized the first Cannonball in 2010, setting out from Kittyhawk, North Carolina, with 45 riders bound for the west coast. Isam had two reasons for inventing the Cannonball. First, he wanted to motivate vintage motorcycle collectors to actually ride their antique machines. He thought collecting road stories out in the wind was better than collecting dust in a museum. Second, Isam wanted to pay homage to long-distance motorcycle pioneer, Erwin “Cannonball” Baker, who set many early transcontinental records. In 1913, Baker made one record-setting run on a seven-horsepower Indian motorcycle. It ended in Savannah, Georgia, where, once there, he entered the 300-mile national championship — on the same machine he had just ridden across the country. Baker got the nickname “Cannonball” from a New York newspaper writer in 1914. He compared Baker to the Cannonball Express train of the Illinois Central line, made famous by Casey Jones. Isam figured, if history-making figures like Baker could get across the United States on roads that were rarely paved, with terrible maps and no GPS, certainly modern riders could do the same — on the same bikes. He was right. His Motorcycle Cannonball was a success from the start with more riders entering each year. This year, the run is at capacity. Isam died of cancer in August 2017. Before that happened, he handed the Cannonball over to Sims, also of Sturgis, South Dakota. “We’ve got a lot of feelings going around the parking lot here today, not having him here with us — even though he is with us here, in spirit,” said Sims. In case your mind is going there, the Motorcycle Cannonball has nothing to do with “The Cannonball Run,” a cheesy, 1981 car race movie starring the recently-deceased Burt Reynolds and Dom DeLuise. It’s also not related to the Cannonball Baker Sea-To-Shining-Sea Memorial Trophy Dash, a rally organized by the movie’s screenwriter. They’re just all homages to the same Cannonball Baker. 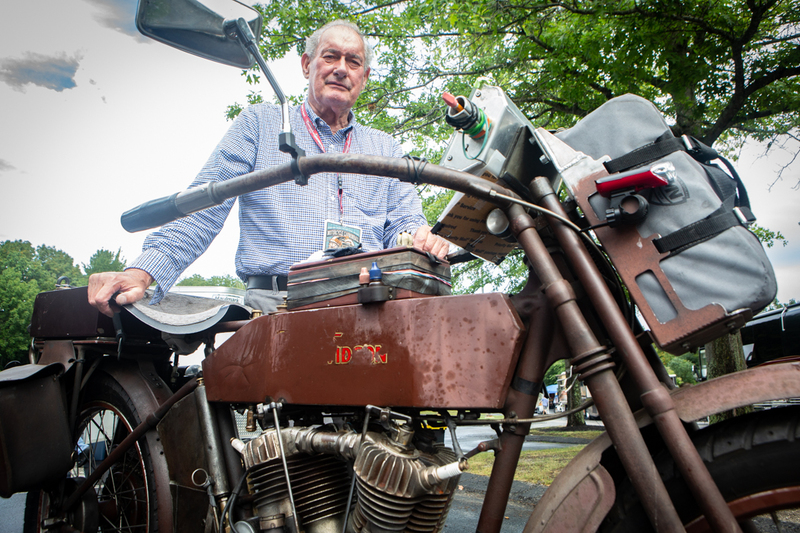 Antique motorcycle endurance legend Victor Boocock stands next to his 1914 Harley-Davidson motorcycle in South Portland on Thursday. Boocock bought it in 1973. He’ll ride it to the west coast in his fifth run of the Motorcycle Cannonball, which gets underway in Portland on Saturday. Victor Boocock, from San Carlos, California, is probably the oldest rider making the run this year. He’ll turn 76 halfway across the country. On his birthday, he’ll be riding a bike he’s owned for more than half his life: a 1914 Harley-Davidson. The 2018 Cannonball will be his fifth on the bike. Boocock is originally from England. He moved to the United States in 1964. He’s made many other long-distance rides on his faithful steed over the years, too. He says it’s hard putting into words exactly what he loves about riding old bikes across his adopted country. “I’ve come to believe that it’s only a means to an end,” he said. The end, for Boocock, is really the trip, itself. It’s the wide-open country, the scenery, the history. It’s also meeting new people, old comrades and fierce, friendly competition. “It’s a journey. That’s the story of this bike,” he said, his voice trailing off. Boocock looked away for a moment, patting the seat, collecting himself. 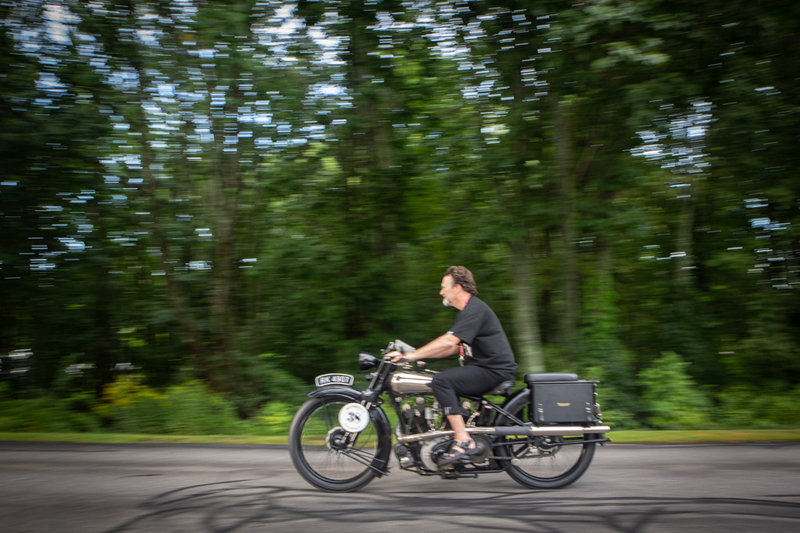 Paul d’Orleans of San Francisco works the bugs out of his 1926 Brough Superior motorcycle in South Portland on Thursday before riding it across the country in the Motorcycle Cannonball endurance run.